I just starting making mini quiches weekly to keep in the fridge as a quick snack or meal. I usually cook up any combo of eggs and veggies in muffin trays. They are really simple to make and make following the diet really easy no matter what phase you are in. During the Attack phase just use eggs and meat. The add veggies in future phases. 2. Bring a saute pan to medium low heat and add the butter. Once melted, add the onions and cook for about 30-45 minutes until deep brown and caramelized. Stir when needed to prevent burning. Once finish stir in the thyme and season with salt and pepper to your liking. 3. Remove the onions from the pan and add the mushrooms. Cook for about ten minutes until softened and season with salt and pepper to your liking. There should be enough residual butter leftover so the mushrooms don’t burn, but if needed add some cooking spray. Mix together with the onions when finished. 4. While the mushrooms are cooking, whisk together the eggs, egg whites, milk, salt, and Worcestershire. Stir in the cheese. 5. 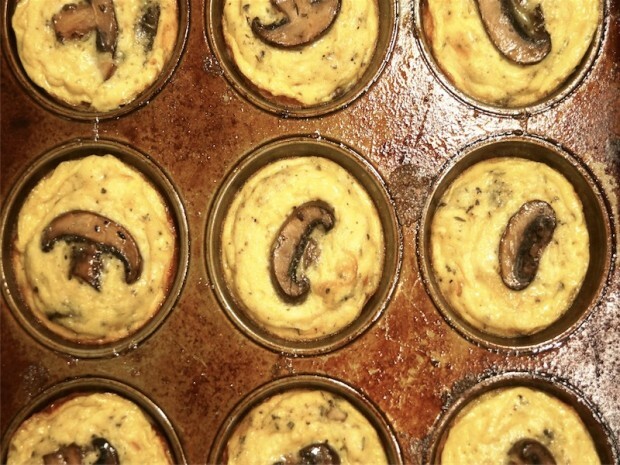 Spray your muffin tin with cooking spray. Divide the mushroom mixture between the 12 cups, saving 12 mushrooms slices if you want to place them on top. Then pour the egg mixture over. Add the mushroom slice if you would like them for the top. This is purely decorative. 6. Bake for about 15 minutes until cooked through. Let rest for 5-10 minutes before serving. Delicious warm or cold.